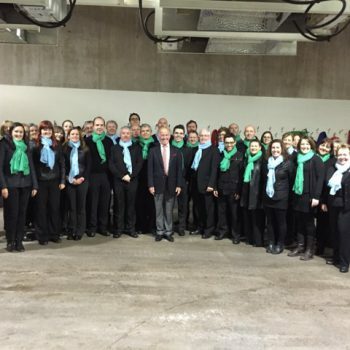 Haydn has considerable experience in working with massed choirs. 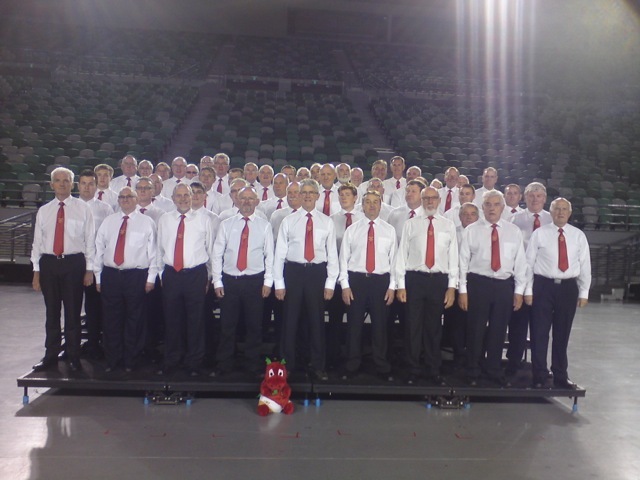 He has conducted nine male choir festivals at the Royal Albert Hall (the ‘1000 Voices’), as well as choirs of between 300-800 voices in Birmingham Symphony Hall, Brecon, Cardiff Castle, the Wales Millennium Centre, Cardiff’s St David’s Hall, Sioux City Iowa, Toronto, Sydney Opera House and New York’s Carnegie Hall. 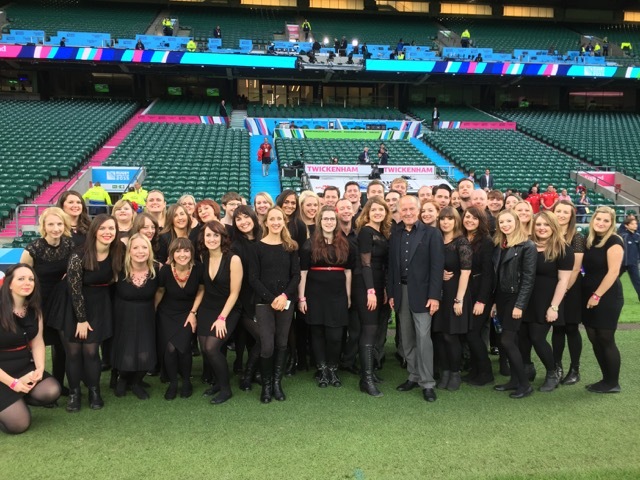 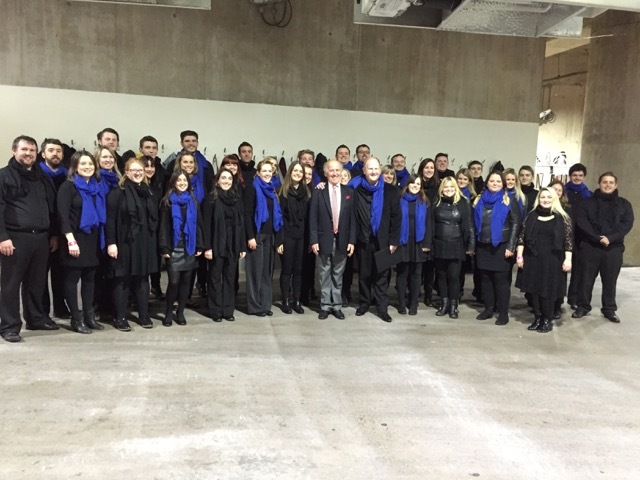 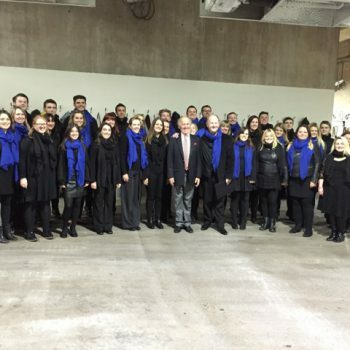 Haydn was privileged to conduct the singing of the National Anthems with some of the very best UK choirs at ten games in the 2015 Rugby World Cup, in Twickenham, Wembley Stadium and the Millennium/Principality Stadium in Cardiff. 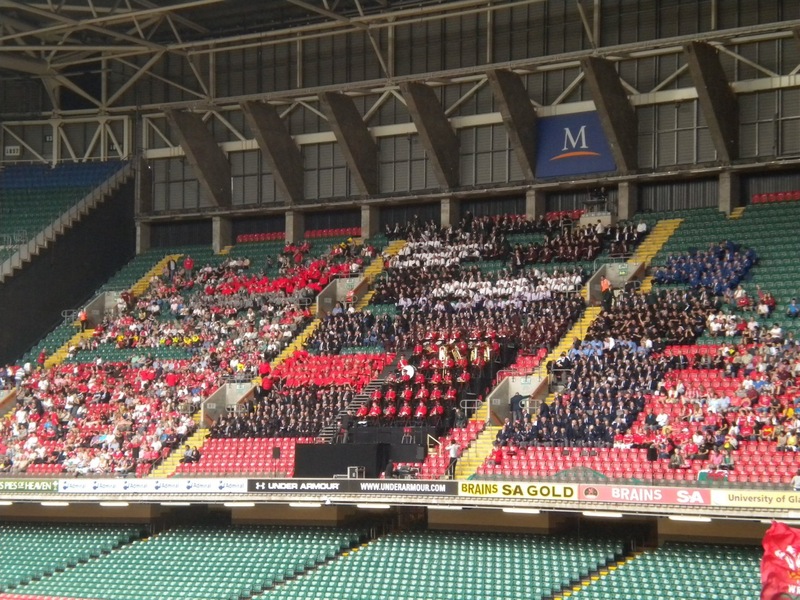 Mixed Choirs were used throughout the tournament, and the photos below are from some of the games. 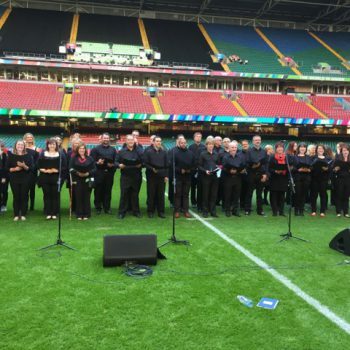 As Musical Director working with the Welsh Rugby Union, Haydn has conducted bands, choirs and supporters at more than 125 international matches at Cardiff’s Millennium/Principality Stadium over the past sixteen seasons. 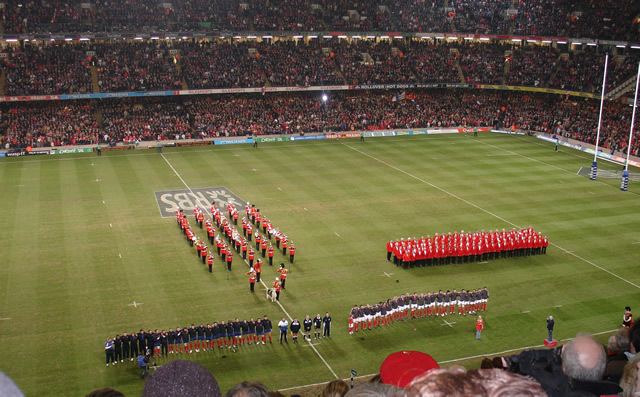 He has travelled to Murrayfield in Scotland, Stade de France in Paris and Newlands in Cape Town to conduct the singing and Welsh Anthem, as well as to Australia, New Zealand and South Africa with Melody Music’s British and Irish Lions Choir, where he led the singing before many of the Test Matches and entertained supporters in ‘The Lions Den’. 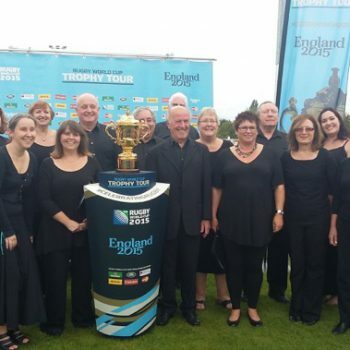 He conducted the British and Irish Lions Choir on the 2013 Lions Tour, where they sang on the field prior to the first test at Brisbane and gave concerts in Brisbane, Melbourne and Sydney. 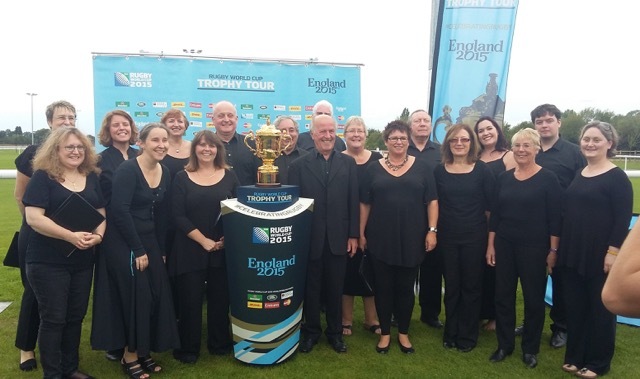 Haydn has also conducted the singing before many cup final games at Cardiff, Twickenham and Wembley, including the Heineken Cup, the EDF Cup, the Powergen Cup and the LDV Vans Trophy, as well as at Lords Cricket Ground on the occasion of an England international cricket match. 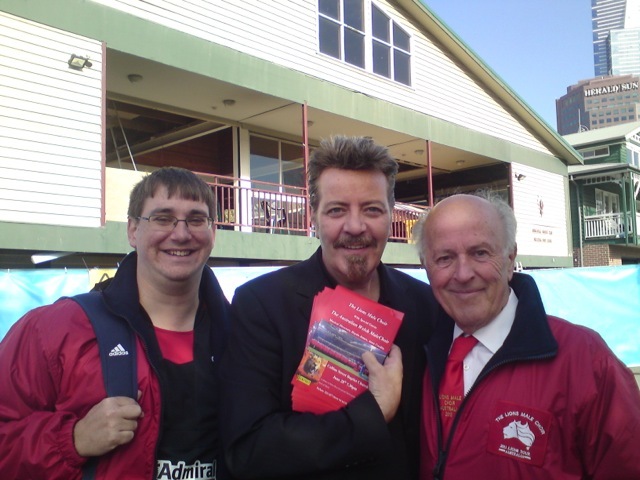 In 2008, he was honoured to appear at the FA Cup Final in Wembley, working with the Band of the Grenadier Guards, Lesley Garrett and Katherine Jenkins. 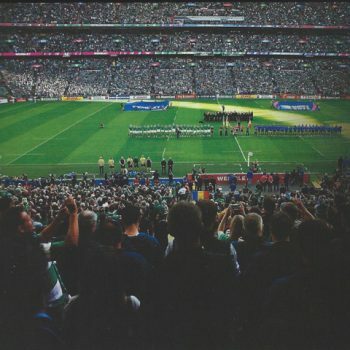 Haydn is seen here leading the singing at Wembley Stadium prior to the 2008 FA Cup Final. 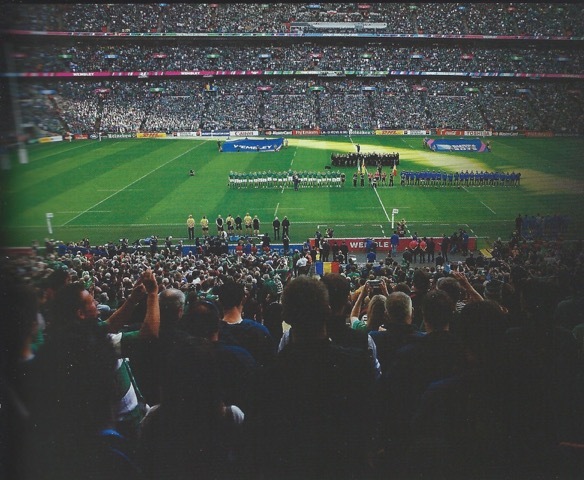 Haydn has been involved in three Rugby Union World Cup tournaments – in 1999, he was Assistant Musical Director in Cardiff, and in 2007 travelled to Paris to work with a French Choir and Band in the recording of five National Anthems for the tournament. 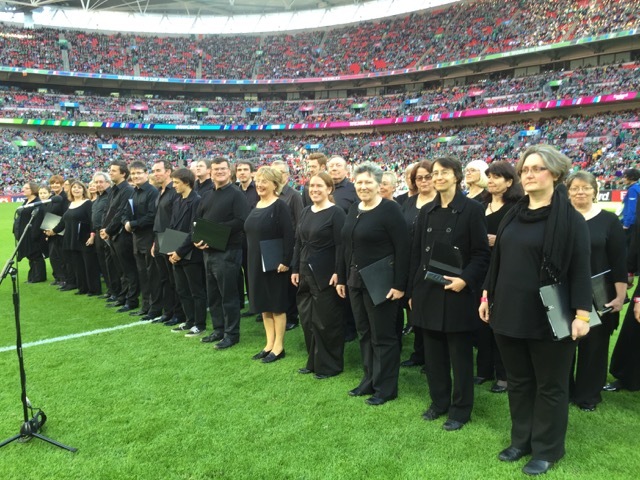 In 2015, Haydn conducted the singing at ten World Cup games in Cardiff, Wembley and Twickenham Stadiums. 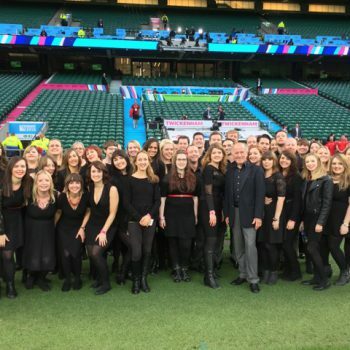 Haydn has now led the singing and Anthems at six Rugby League Cup finals in Cardiff and Wembley, and conducted at the opening ceremony of the Rugby League World Cup in October 2013, and also at the semi-finals in Wembley Stadium. 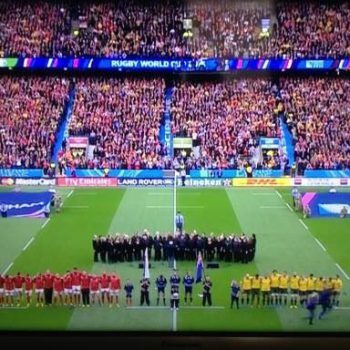 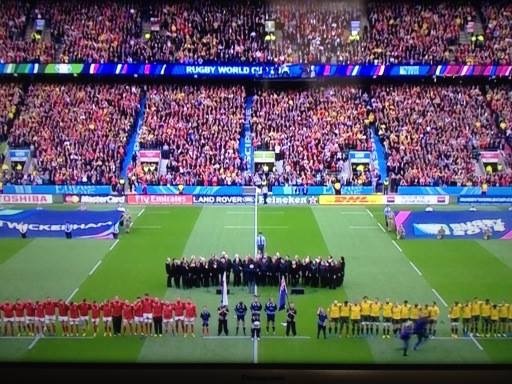 The photograph opposite shows 1000 singers (24 choirs) who were brought together for a Wales v Australia game; another choir of 1800 voices (42 choirs) appeared at a Wales v Barbarians game. 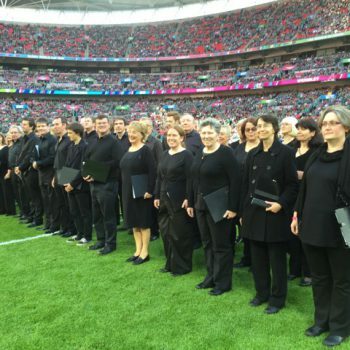 Haydn will assemble and direct choirs for the four Autumn Internationals in 2017, and for the Six Nations games in 2018. 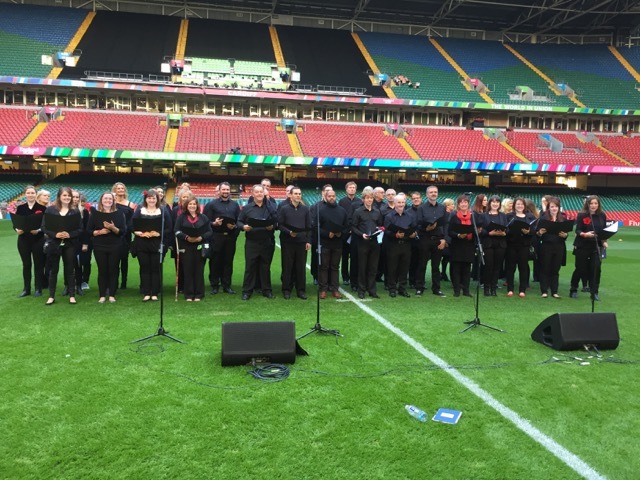 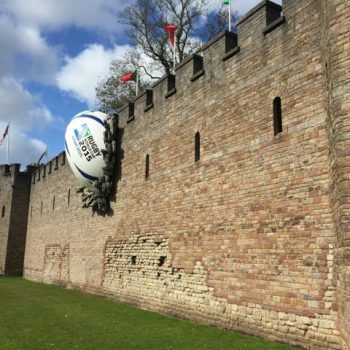 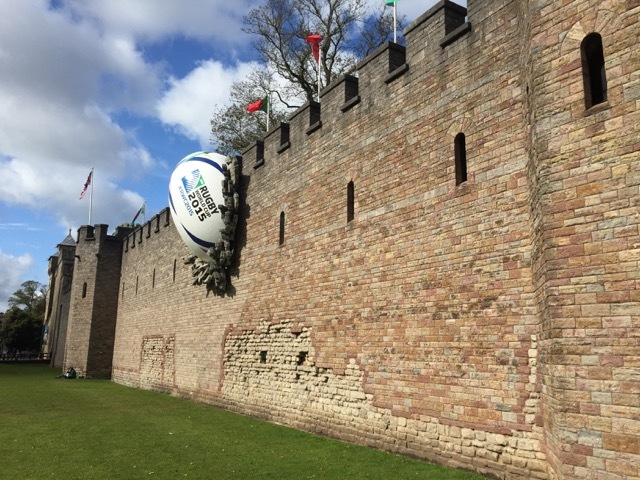 In May 2017, Haydn was privileged to be invited to join the British & Irish Lions at their training camps in Wales and Ireland, and help with preparation of songs for the tour to New Zealand. 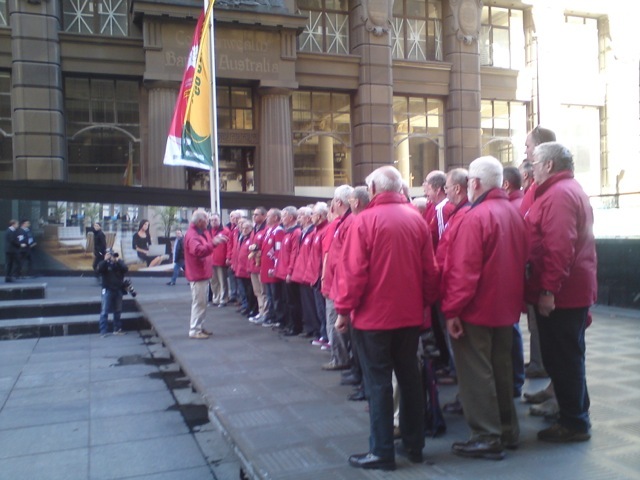 The British & Irish Lions on tour in Australia in 2013. 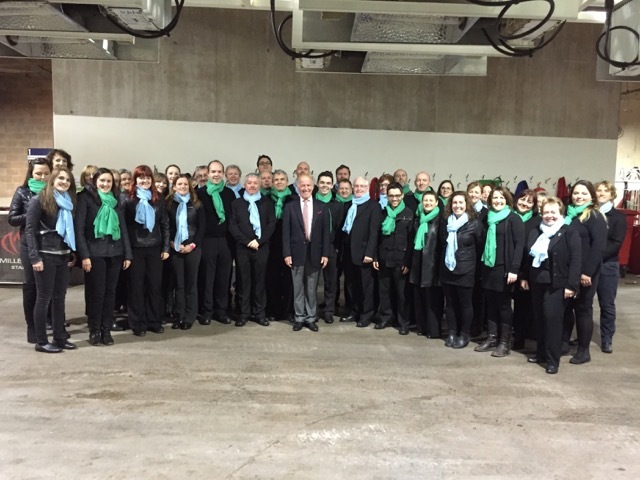 Haydn is seen with accompanist David Last and MD of Melody Music, Mark Burrows.